The Middle Atlantic WS Series Laminate Writing Shelf WS3-M31-18 provides a secure work surface for use with your MRK Series enclosure. This rack is offered in varied lengths to suit any number of ganged racks. 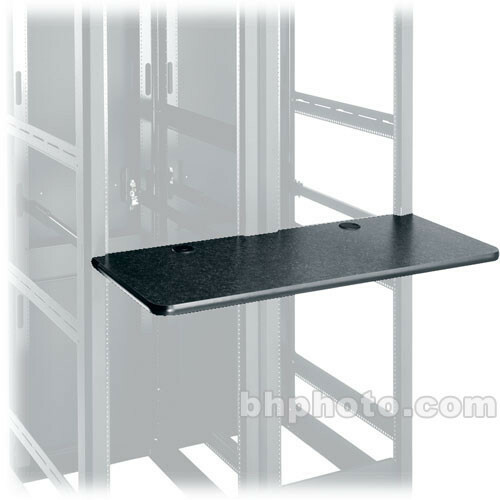 The shelf itself features an attractive, 1" thick, graphite-marbled, laminate surface with a durable, black, T-mold edging. The included mounting system consists of sturdy, steel tubes that attach to the front and rear rack rails in each rack bay and extend beneath the shelf for extra support. Each writing shelf includes cable, pass-through holes with grommets for effective cable management. The shelf occupies 2U of rack space. This model has been designed for use with MRK 31" deep racks and spans 3 bays. Make your enclosure more useful by adding a work area. Graphite, marbled, laminate surface ensures years of reliable use.